I’m working on an exhibition of Bauhaus posters that I’ve collected in trips to Germany. These are not the vintage posters from the 1920s but new designs from the last fifteen years, mostly for exhibitions of historical Bauhaus work. 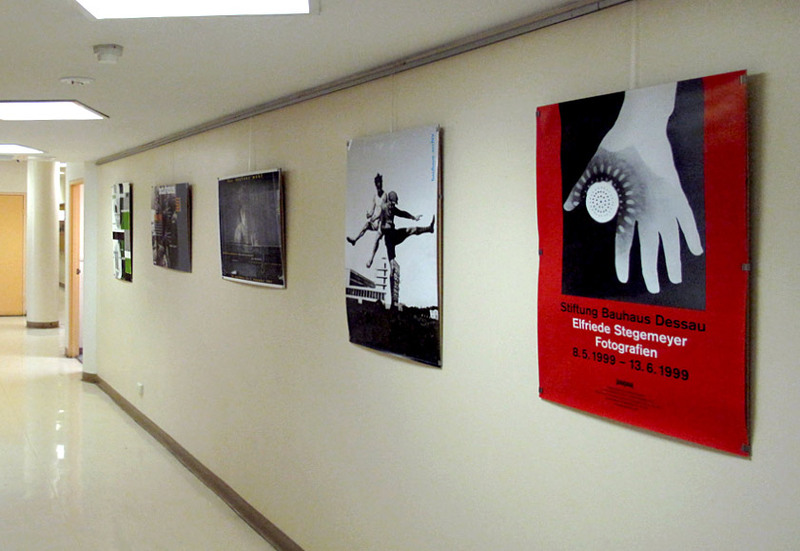 The red poster above advertises work by the former student Elfriede Stegemeyer. The Bauhaus is alive and well in Germany with two museums and the two original buildings at Weimar and Dessau still standing and still thriving design institutes. The posters are interesting for the way their layouts reflects the Constructivist principles of the original period, but refracted through the changing taste of the intervening years. The Stegemeyer poster, for example, looks sufficiently period to pass at first glance but would never, ever be composed symmetrically in the era of New Typography in the twenties. The photo shows the corridor at my work, the visual art department at NMIT where I’ve hung a selection. Soon I’ll have a full show at Grenadi School of Design.